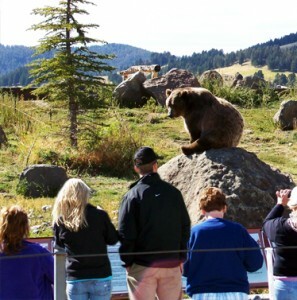 Welcome to Montana Grizzly Encounter; a Grizzly Bear Rescue & Education Sanctuary in Bozeman, Montana. Founded in 2004, MGE provides a spacious and natural home for rescued grizzlies. At the same time it offers the public a place to come and learn about grizzly bears as they watch the majestic animals “up close” in a beautiful mountain setting. All of our bears were born in unfortunate captive situations and could NEVER be released into the wild. The bears have been rescued from often inhumane captive situations all over the U.S.
We provide the bears with the best possible life here at the sanctuary. At the same time we give people an opportunity to see and understand this awesome creature safely, up close, with no bars or cages to obstruct the view. The Grizzly Encounter is open to school groups free of charge, and each year thousands of children learn about grizzly bear safety and conservation. In this way, Brutus, Bella, Sheena, Jake, Maggi and Montana Grizzly Encounter are doing their best to help insure that there will be wild bears in our forests for generations to come.